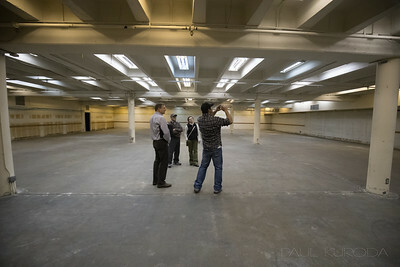 Developers tour the basement of the former department store now being redeveloped by Alameda County on 17 03 09 , 3295 Castro Valley Boulevard, Castro Valley, California. Photo by Paul Kuroda. Alameda County is offering developers an opportunity to transform the former Daughtrey’s Department Store into an exciting restaurant, food-related and retail project. The County is seeking a development team to deliver a high-quality, transformative project that will draw customers downtown and fulfill the community’s desire for new dining and shopping experiences. The County envisions a public/private partnership where the purchase price will be negotiated on a pro forma basis, with a strong focus on achieving the community’s goals for this key opportunity site. Offices with a view of the main floor of the interior, awaits developing on 03-09-17, 3295 Castro Valley Boulevard, Castro Valley, California. Photo by Paul Kuroda. Alameda County is offering developers an opportunity to transform the former Daughtrey’s Department Store into an exciting restaurant, food-related and retail project. The County is seeking a development team to deliver a high-quality, transformative project that will draw customers downtown and fulfill the community’s desire for new dining and shopping experiences. The County envisions a public/private partnership where the purchase price will be negotiated on a pro forma basis, with a strong focus on achieving the community’s goals for this key opportunity site. 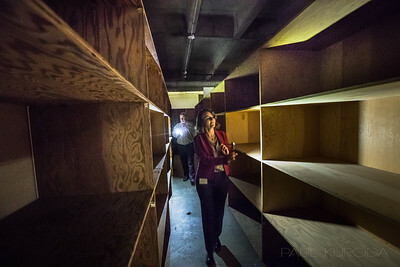 Mike Tacconi, President of the Board of Directors of the Castro Valley/Eden Area Chamber of Commerce and Eileen Dalton of Alameda County Community Development Agency, Economic & Civic Development Director walk through isles of shelving used to store merchandise in the former department store's basement on March 9, 2017, 3295 Castro Valley Boulevard, Castro Valley, California. Photo by Paul Kuroda. Alameda County is offering developers an opportunity to transform the former Daughtrey’s Department Store into an exciting restaurant, food-related and retail project. The County is seeking a development team to deliver a high-quality, transformative project that will draw customers downtown and fulfill the community’s desire for new dining and shopping experiences. The County envisions a public/private partnership where the purchase price will be negotiated on a pro forma basis, with a strong focus on achieving the community’s goals for this key opportunity site. 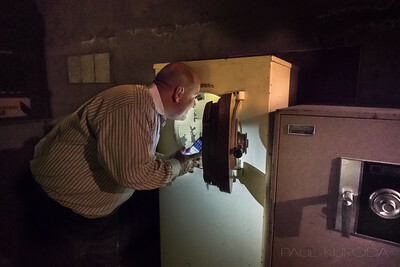 Mike Tacconi, President of the Board of Directors of the Castro Valley/Eden Area Chamber of Commerce looks at one of the safes in the former department store's basement on March 9, 2017, 3295 Castro Valley Boulevard, Castro Valley, California. Photo by Paul Kuroda. Alameda County is offering developers an opportunity to transform the former Daughtrey’s Department Store into an exciting restaurant, food-related and retail project. The County is seeking a development team to deliver a high-quality, transformative project that will draw customers downtown and fulfill the community’s desire for new dining and shopping experiences. The County envisions a public/private partnership where the purchase price will be negotiated on a pro forma basis, with a strong focus on achieving the community’s goals for this key opportunity site. 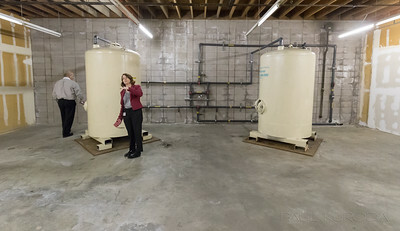 Mike Tacconi, President of the Board of Directors of the Castro Valley/Eden Area Chamber of Commerce and Eileen Dalton of Alameda County Community Development Agency, Economic & Civic Development Director look at holding tank for water collected by sumps in the former department store's basement on March 9, 2017, 3295 Castro Valley Boulevard, Castro Valley, California. 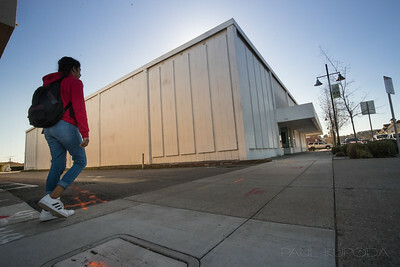 Photo by Paul Kuroda. . Alameda County is offering developers an opportunity to transform the former Daughtrey’s Department Store into an exciting restaurant, food-related and retail project. The County is seeking a development team to deliver a high-quality, transformative project that will draw customers downtown and fulfill the community’s desire for new dining and shopping experiences. The County envisions a public/private partnership where the purchase price will be negotiated on a pro forma basis, with a strong focus on achieving the community’s goals for this key opportunity site. 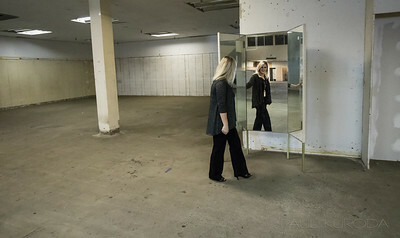 Kristin Perrault, Alameda County ECD Assistant, at a mirror still standing in the former Daughtrey's Department Store on March, 9,2017, 3295 Castro Valley Boulevard, Castro Valley, California. 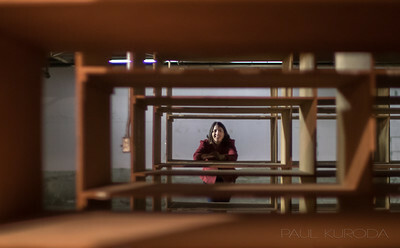 Photo by Paul Kuroda. 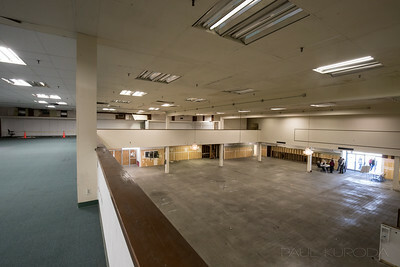 Alameda County is offering developers an opportunity to transform the former Daughtrey’s Department Store into an exciting restaurant, food-related and retail project. The County is seeking a development team to deliver a high-quality, transformative project that will draw customers downtown and fulfill the community’s desire for new dining and shopping experiences. The County envisions a public/private partnership where the purchase price will be negotiated on a pro forma basis, with a strong focus on achieving the community’s goals for this key opportunity site. 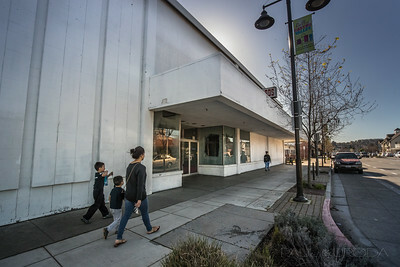 Street front of the former Daughtrey's Department Store on March, 9,2017, 3295 Castro Valley Boulevard, Castro Valley, California. Photo by Paul Kuroda. Alameda County is offering developers an opportunity to transform the former Daughtrey’s Department Store into an exciting restaurant, food-related and retail project. The County is seeking a development team to deliver a high-quality, transformative project that will draw customers downtown and fulfill the community’s desire for new dining and shopping experiences. The County envisions a public/private partnership where the purchase price will be negotiated on a pro forma basis, with a strong focus on achieving the community’s goals for this key opportunity site. The building of the former Daughtrey's Department Store on March, 9,2017, 3295 Castro Valley Boulevard, Castro Valley, California. Alameda County is offering developers an opportunity to transform the former Daughtrey’s Department Store into an exciting restaurant, food-related and retail project. The County is seeking a development team to deliver a high-quality, transformative project that will draw customers downtown and fulfill the community’s desire for new dining and shopping experiences. The County envisions a public/private partnership where the purchase price will be negotiated on a pro forma basis, with a strong focus on achieving the community’s goals for this key opportunity site. 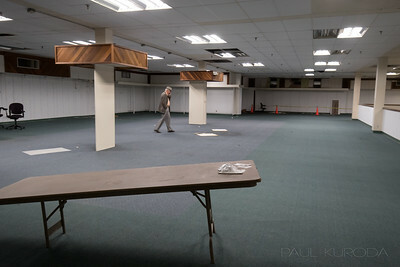 Interior of the former Daughtrey's Department Store on March, 9,2017, 3295 Castro Valley Boulevard, Castro Valley, California. . Alameda County is offering developers an opportunity to transform the former Daughtrey’s Department Store into an exciting restaurant, food-related and retail project. The County is seeking a development team to deliver a high-quality, transformative project that will draw customers downtown and fulfill the community’s desire for new dining and shopping experiences. The County envisions a public/private partnership where the purchase price will be negotiated on a pro forma basis, with a strong focus on achieving the community’s goals for this key opportunity site. 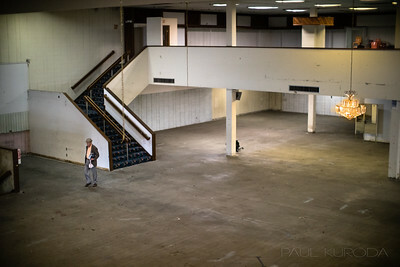 Balcony of the former Daughtrey's Department Store on March, 9,2017, 3295 Castro Valley Boulevard, Castro Valley, California. Alameda County is offering developers an opportunity to transform the former Daughtrey’s Department Store into an exciting restaurant, food-related and retail project. The County is seeking a development team to deliver a high-quality, transformative project that will draw customers downtown and fulfill the community’s desire for new dining and shopping experiences. The County envisions a public/private partnership where the purchase price will be negotiated on a pro forma basis, with a strong focus on achieving the community’s goals for this key opportunity site. 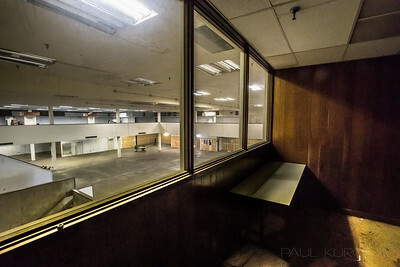 Interior as seen from the balcony of the former Daughtrey's Department Store on March, 9,2017, 3295 Castro Valley Boulevard, Castro Valley, California. Alameda County is offering developers an opportunity to transform the former Daughtrey’s Department Store into an exciting restaurant, food-related and retail project. The County is seeking a development team to deliver a high-quality, transformative project that will draw customers downtown and fulfill the community’s desire for new dining and shopping experiences. The County envisions a public/private partnership where the purchase price will be negotiated on a pro forma basis, with a strong focus on achieving the community’s goals for this key opportunity site. 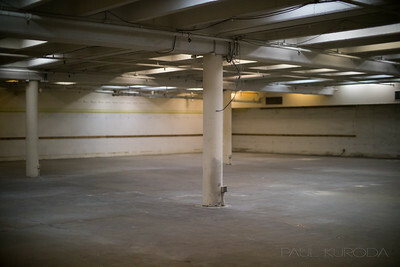 Basement of the former Daughtrey's Department Store on March, 9,2017, 3295 Castro Valley Boulevard, Castro Valley, California. Alameda County is offering developers an opportunity to transform the former Daughtrey’s Department Store into an exciting restaurant, food-related and retail project. The County is seeking a development team to deliver a high-quality, transformative project that will draw customers downtown and fulfill the community’s desire for new dining and shopping experiences. The County envisions a public/private partnership where the purchase price will be negotiated on a pro forma basis, with a strong focus on achieving the community’s goals for this key opportunity site. 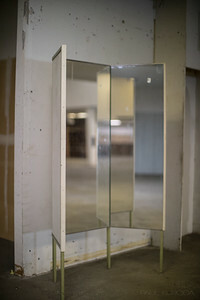 Mirrors still stand at of the former Daughtrey's Department Store on March, 9,2017, 3295 Castro Valley Boulevard, Castro Valley, California. Alameda County is offering developers an opportunity to transform the former Daughtrey’s Department Store into an exciting restaurant, food-related and retail project. The County is seeking a development team to deliver a high-quality, transformative project that will draw customers downtown and fulfill the community’s desire for new dining and shopping experiences. The County envisions a public/private partnership where the purchase price will be negotiated on a pro forma basis, with a strong focus on achieving the community’s goals for this key opportunity site. 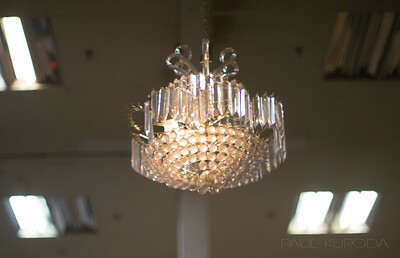 Chandeliers still hang on 17 03 09 , 3295 Castro Valley Boulevard, Castro Valley Castro Valley, California. Photo by Paul Kuroda. Alameda County is offering developers an opportunity to transform the former Daughtrey’s Department Store into an exciting restaurant, food-related and retail project. The County is seeking a development team to deliver a high-quality, transformative project that will draw customers downtown and fulfill the community’s desire for new dining and shopping experiences. The County envisions a public/private partnership where the purchase price will be negotiated on a pro forma basis, with a strong focus on achieving the community’s goals for this key opportunity site. 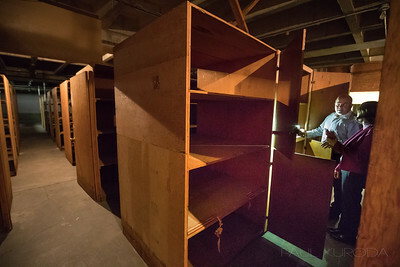 Eileen Dalton of Alameda County Community Development Agency, Economic & Civic Development Director looking through isles of shelving used to store lay-away merchandise in the former department store's basement on March 9, 2017, 3295 Castro Valley Boulevard, Castro Valley, California. Photo by Paul Kuroda. Alameda County is offering developers an opportunity to transform the former Daughtrey’s Department Store into an exciting restaurant, food-related and retail project. The County is seeking a development team to deliver a high-quality, transformative project that will draw customers downtown and fulfill the community’s desire for new dining and shopping experiences. The County envisions a public/private partnership where the purchase price will be negotiated on a pro forma basis, with a strong focus on achieving the community’s goals for this key opportunity site. 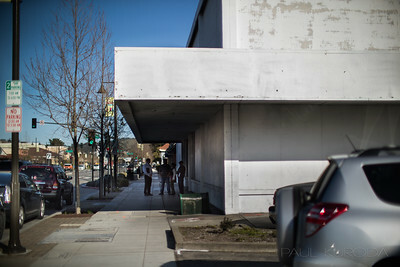 Side front of the former Daughtrey's Department Store on March, 9,2017, 3295 Castro Valley Boulevard, Castro Valley, California. Photo by Paul Kuroda. Alameda County is offering developers an opportunity to transform the former Daughtrey’s Department Store into an exciting restaurant, food-related and retail project. The County is seeking a development team to deliver a high-quality, transformative project that will draw customers downtown and fulfill the community’s desire for new dining and shopping experiences. The County envisions a public/private partnership where the purchase price will be negotiated on a pro forma basis, with a strong focus on achieving the community’s goals for this key opportunity site.